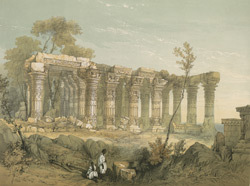 This is plate 6 from James Fergusson's book 'Ancient Architecture in Hindoostan'. Chandravati is a small abandoned site near Jhalarapatan in Rajasthan. Ruined temples such as this were constructed as early as the 7th century. Many sculptures formerly at this site were removed at a later date to Jhalarapatan.